I love the bright citrus flavour of this loaf. Easy to make, and easier to eat! This loaf takes little more than 10 minutes to put together, and while it is baking the citrus aroma is fantastic. Grate 1 tbsp peel from lemon and squeeze 1 tbsp juice, set aside. Grate 1 tbsp orange peel and squeeze 5 tbsp juice, set aside. Stir the wet ingredients into the larger bowl, and mix only until just holding together. If you mix it too much the dough won’t be quite as tender. In large bowl cut softened butter into flour, baking powder, salt and 1 cup sugar. Stir in peel. In small bowl beat eggs, milk and4 tbsp orange juice lightly. Stir into flour mixture just until flour is moist. Do not over mix! Spoon into greased and lightly floured loaf pan, baking for 1 hour. Test, and when you tester comes out clean, remove from oven and allow to rest 10 minutes in loaf pan before removing. If you line the loaf pan with parchment paper it makes removal quick and easy. In saucepan, heat lemon juice, 1 tbsp orange juice and 2 tbsp sugar until boiling. Cool, stirring, for about 3 minutes. Brush over loaf once it has cooled off a bit, but not cold. Boil the juices and sugar long enough for the syrup to thicken slightly, then remove from heat. Every bite is light, juicy, citrusy and that glaze over the top is absolutely divine. This is a vegan recipe! I know, maybe not that big a deal to some people but I’m sort of a carnivore. This is so delicious it can be served alongside pretty much any dish you enjoy. Truthfully, my carnivorous tendencies are changing, albeit slowly. My mind set is still that I think of what meat or protein I want to cook, then I work the rest of the meal around that. However …. I’ve noticed that ever so slowly, my meat or protein is shrinking. Tonight I served this veg dish along with pork cutlet and tonkatsu sauce. A 3 ounce pork cutlet served both my husband and I, without either of us feeling like anything was missing …. changes are coming and we are right on board. To make sauce, whisk together all ingredients until smooth, taste and adjust seasonings. It is hard to correct if you have used to much lemon, so start with 2 tbsp and if you like it “lemony”, add a bit more. Wash veg thoroughly, (those bok choy have a tendency to hide grit). Heat fry or sauce pan, add onion, and saute lightly, add bok choy and peppers, drizzle with a bit of extra sesame oil. Cook for 4-6 minutes, just until crisp tender. Remove from heat and drizzle sauce over top, then sprinkle with sesame seeds. 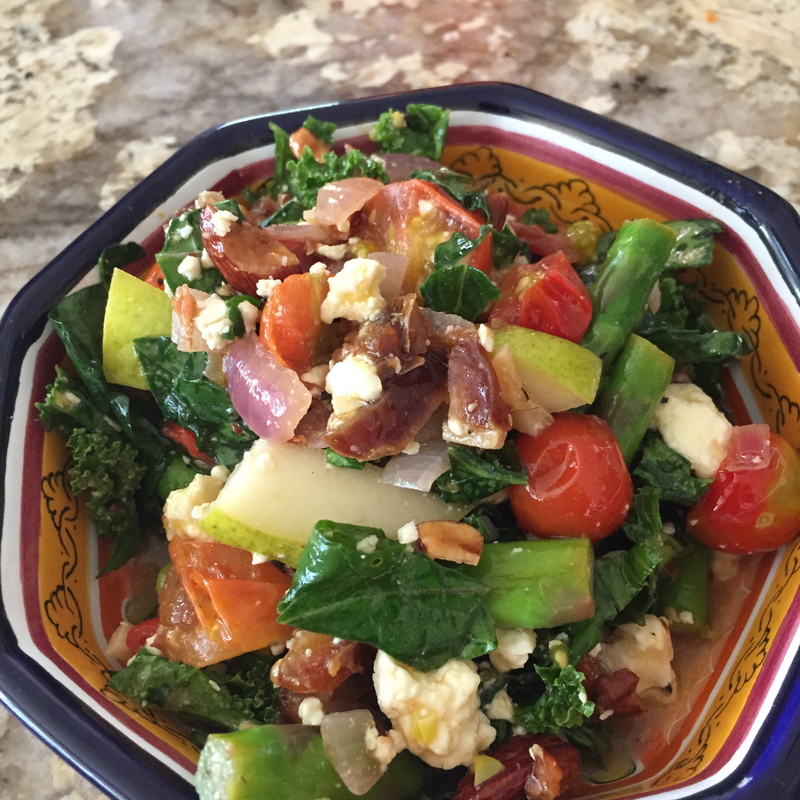 I wanted to credit Joni for this delicious salad – served warm or at room temperature, but she insisted I give the credit to her sister Brita, who originally came up with this – regardless of who gets credit, I will happily take it now as I post it and recreate it in my own kitchen! So delicious, and like lots of salads it is easy to adapt with whatever you have on hand or in your fridge. This delicious salad is equally great served warm or at room temperature. Saute onion until translucent, then add garlic and asparagus and cook only until asparagus is tender crisp, add cherry tomatoes, stir and remove from heat. Combine all ingredients – tossing in a large bowl with warm onion/garlic mixture and dressing. This salad is so delicious and packed with nutritious bites that it can easily be a full meal – if you like add shrimp or cooked chicken, maybe a little quinoa?? Nailed it! Blueberries are in season right now, and that means deliciousness ….. blueberry ice cream, blueberry pie, and naturally – blueberry muffins. The coconut and lemon really bring the tastebuds out to party. 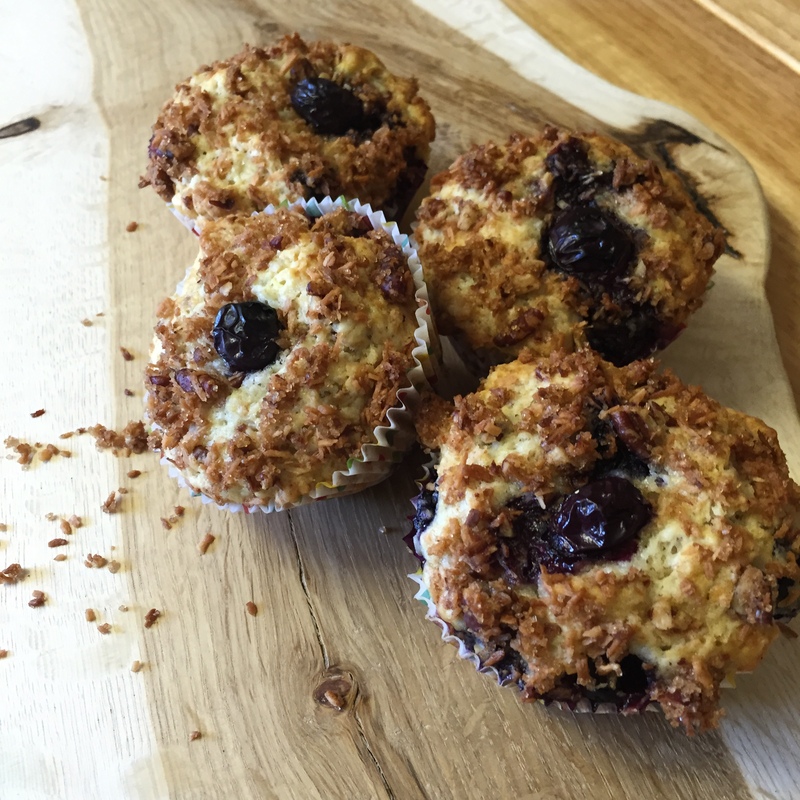 I had a craving for blueberry and lemon together … then thought of the oat flakes I love in muffins so created this recipe out of a mash up of my other muffin recipes. Let me know what you think. Pecan crumble gently pressed on – muffins are ready for the oven. Combine all topping ingredients and set aside. In large mixing bowl combine first 8 ingredients and whisk to blend. In smaller bowl beat egg, add milk, vanilla and melted coconut oil. Gently mix liquid ingredients into dry, being careful not to overmix. Stir in blueberries. Once just combined, fill prepared muffin tins, and press a bit of topping into each muffin – adding 1 blueberry to the center of each muffin. Insert a toothpick – if it comes out clean, remove from oven and allow to cool for 10 minutes before removing from muffin tin. Sometimes an old fashioned, tried and true ginger cake is so comforting you wonder how it hasn’t been made for a while! Moist and delicious this is the perfect recipe, topped with Lemon Sauce and a bit of whipped cream to create an amazing bite. 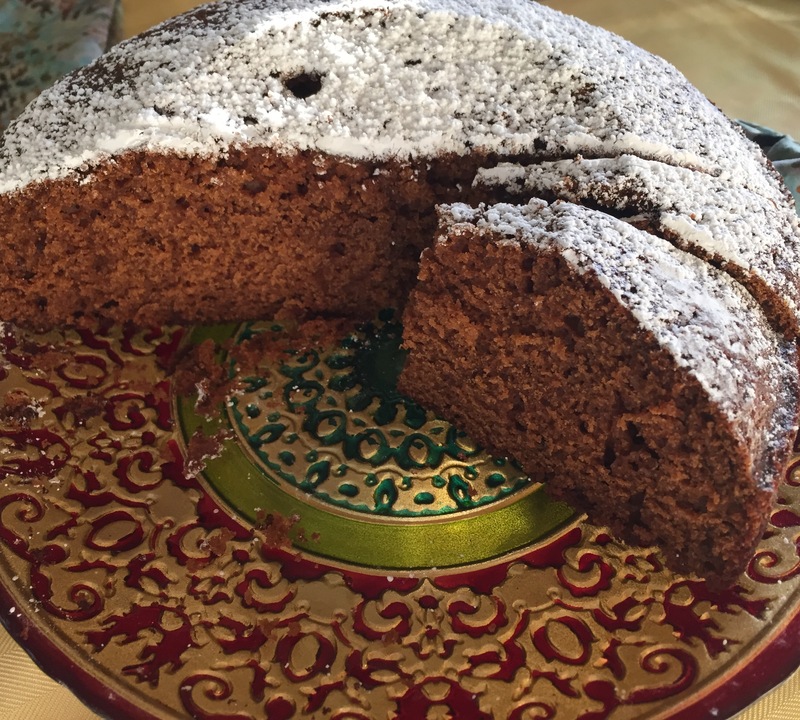 Made for Auntie Brigette’s 88’s birthday dinner, this moist delicious ginger cake was delicious – thanks Vivi! Pour into greased and floured loaf pan or 8 inch round pan. Bake at 400 for 30 minutes. Add lemon rind to boiling water, reduce heat and simmer for 5 minutes. In a small bowl mix cornstarch, sugar and salt. Add water gradually – stirring constantly. Return to saucepan and cook over medium heat for 10 minutes until thickened. Lower heat and cook 5 minutes longer. Remove from heat and stir in lemon juice and butter. Serve warm over ginger cake. This pasta is quick, light and easy. Most of these ingredients are things I have on hand anyway, so as a last minute dinner it always works – add a fresh, crisp green salad and some garlic toast and your meal is perfect. 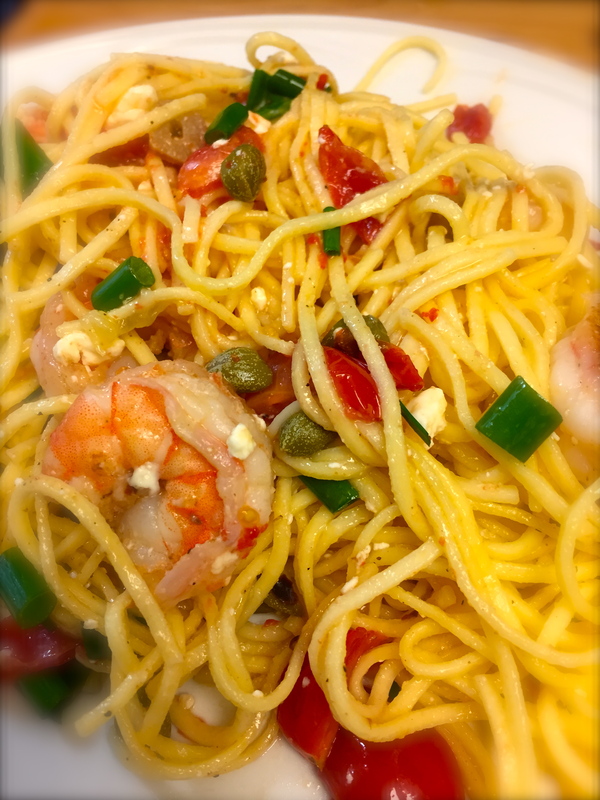 Plump juicy shrimp, fresh tomatoes and spring onions combine with capers for a quick easy dinner. Put on a large pot of water to boil – salt only once it has come to rolling boil. Stir occasionally and cook only until shrimp are cooked through – around 3-4 minutes. Finish with 2 tbsp fresh lemon juice and a knob of butter. Stir well and set aside. By now your water has come to a boil and you are ready to cook your angel hair pasta – add a generous amount of salt to water, then pasta (enough for 4). Cook for time listed on your pasta container – being careful not to overcook. Drain – reserving 1 cup of the pasta liquid. Stir well, adding pasta water as needed to loosen the sauce up a bit and season to taste with salt and pepper. If you don’t have any frozen shrimp on hand, this works really well with chicken too! Be prepared for your house to smell fantastic when these are baking – pretty difficult to wait for them to cool enough to eat! 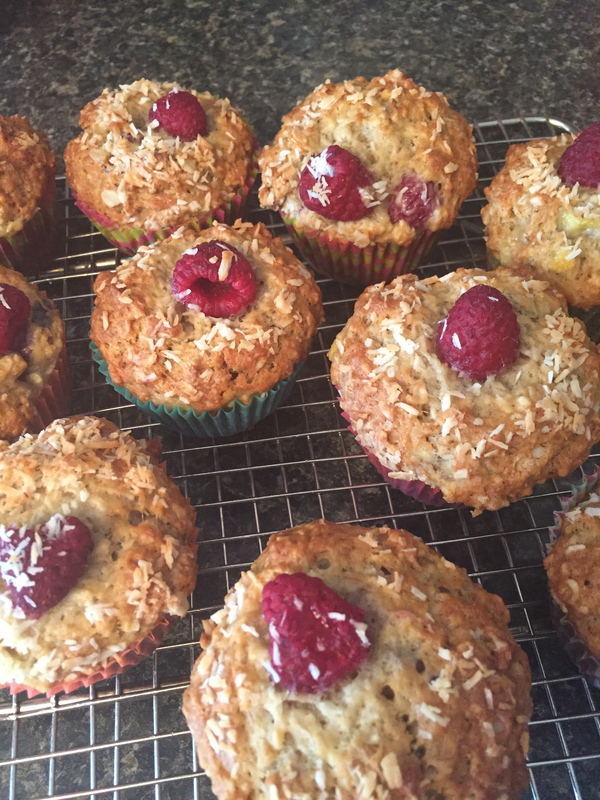 Delicious muffins – loaded with coconut and raspberry with just a hint of lemon to brighten them up. In a small bowl, combine the flour, oat flakes, baking soda, salt, and cinnamon together, mix well. In a large bowl, beat together the coconut oil, sugar, banana, and vanilla until creamy. Add the eggs, one at a time, then continue beating until well combined, finishing with the lemon zest and juice. 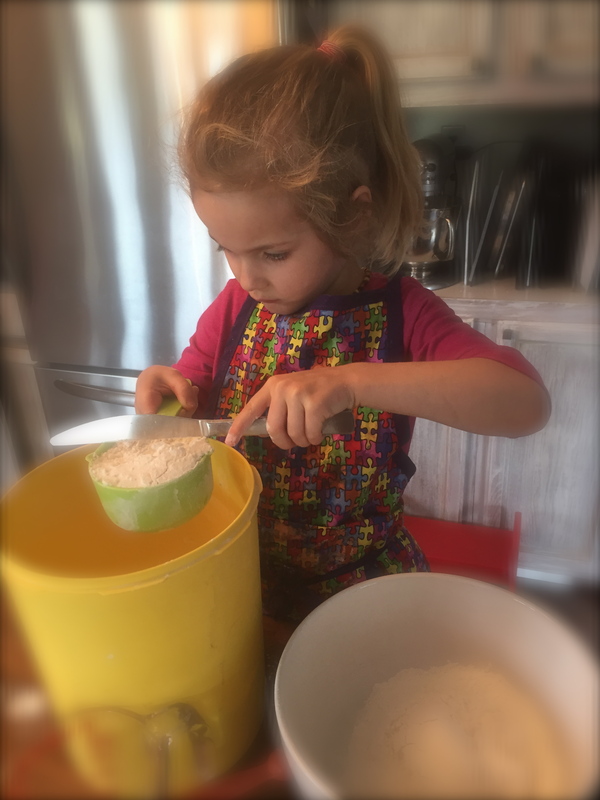 When Sloan and I are cooking we taste and add ingredients by a smidge of this, a dab of that – but baking I tell her, must be precise! Add the flour mixture to the banana mixture and stir until just combined. Add the 3/4 cup of coconut, 1 cup fresh raspberries, and gently mix them into the batter. Spoon the batter evenly into each muffin tin. Add one fresh raspberries to each muffin, pushing them in gently. 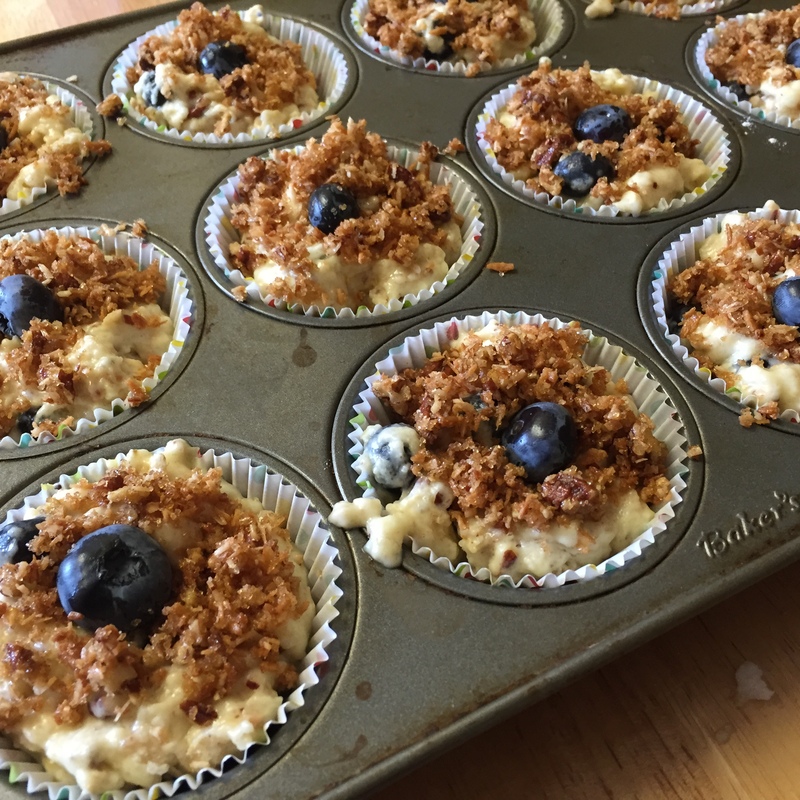 Evenly sprinkle the remaining 1/4 cup of coconut to the tops of each muffin. Place into the oven and bake 20-25 minutes or until a tester inserted into the center comes out clean. Let the muffins cool on a rack.